More and more people prefer to store music online due to various reasons. Let's figure out what aspect you need to consider picking your new cloud storage. Music junkies must be having the best time they've had in their experience. Music comes in such excess that no one can say how many times you need to live to listen to everything that's been released so far. Are you one of them? Then you know what it's like when you want to listen to every single melody. If so, I'm pretty sure you have a fair thousand of records in your possession, and also I'm certain that you are constantly wondering where to store all your music library if it takes up like a TB of memory. With a decent music collection, you might end up stuffing your computer with only music not leaving any other data a chance. Many prefer to store their music on external HHDs since 1) nothing's going to happen to your music, it's safe 2) it saves space on your computer. However, it involves lots of efforts to make, say, an original playlist with tracks from different sources. If you just thought "Well, I can download everything I need," just think about it for a second: Do you always carry an HDD in a bag? Don't reply; we know the answer. We've all been in that situation when the atmosphere could use good vibes, but all you have is some tracks you downloaded three months ago. Do you feel me on that? Then you should consider using a cloud to store your music online. To find the best solution, you must sort out your priorities first. What do you expect from your perfect cloud storage? Is it the capacity that matters? Or are you looking for a minimalistic design? Maybe all you care about is the price. Anyway, choosing the first cloud you come across is no good thing. If you aren't that picky and just need to store your music somewhere, you can consider using a regular cloud service like Dropbox or Google drive. Your music will be safe altogether with your photos, videos, document and other personal data. Let's consider what aspects are important when picking a cloud to store music online. There are many music cloud storages available on the market. Think about the overall size of your music collection. If it's relatively small, you can use free versions of some popular cloud services. Amazon Music, for instance, gives its users space for 250,000 files; Google Play is a bit less kind – 50,000 tracks to upload. Apple Match, unfortunately, can provide space for only 25,000 tracks. On the other hand, providing you have an extensive music library why not go unlimited? 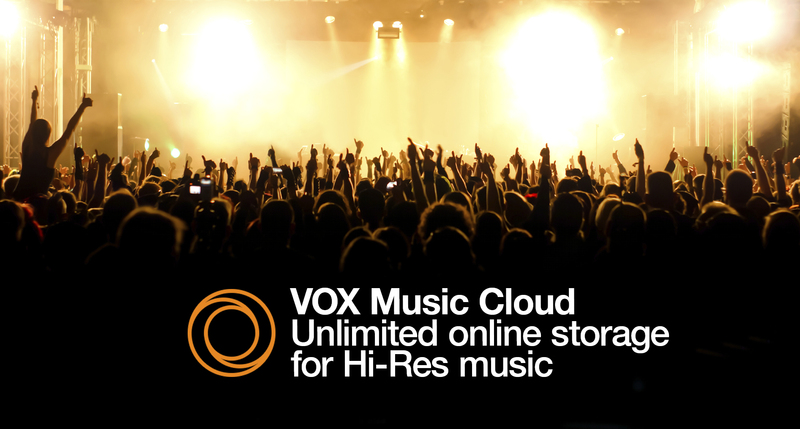 VOX Music Cloud Storage also has no space restrictions, so you're looking for storage to fit everything you have – VOX Cloud is your perfect solution. Start Using VOX Cloud today. Create VOX Premium account. Are you into all extra features available? Do you want your player to help you discover new music as well as suggest you weekly top charts? If so, you might want to subscribe to Google Play Music Premium. It will allow you to stream from their music library and also store your collection. Google Play will get you recommendations so will always be notified when something new's been released (from Bieber to Slayer). However, extra features have the other side of the coin. Many people consider them as excessive and appreciate simplicity and minimalism because when you do have a decent music collection all you value is the sound. Sometimes you just don't want pop-ups or notifications to impose you undue information. It's always the less, the better. VOX Music Player combined with VOX Music Cloud Storage doesn't have too many extra functions. Upload your audio files to VOX on your Mac or VOX cabinet web page, and your music is instantly in VOX Cloud, synchronized with your iPhone. That must be the easiest possible way since VOX Player and VOX Cloud Storage make it a perfect music player with all your collection stored on the Internet. Upload your music within seconds and enjoy. The quality of the sound can either broaden your music experience or completely ruin it. In 2017, it's high time for music to sound as never before. Unfortunately, not all music cloud storages think so. Google Play can give you as much as 320 kbps while Apple Match is even worse with 256 kbps. It means that whatever you upload, these services automatically convert the files to reduce their size. That is unacceptable when it comes to listening to Hi-Res Quality music. In this case, it seems more relevant to keep the original audio files on the computer. But don't get frustrated. VOX Music Cloud Storage doesn't change anything; you listen to exactly what you upload regardless of the file's size or format. It makes the playback at the top of possible. Choose the best cloud to store your music online. If you are a true audiophile, VOX Cloud is the perfect solution for you. It is the storage you've been craving for. By and large, VOX Cloud is an unlimited music cloud to store all your music online and sync your Mac with your iPhone. What makes it that good? This player was designed by audiophiles for audiophiles. You can also cache your favorite tracks and album for listening offline, if you, say, won't be having the Internet connection for some time. To finish, VOX has a great CUSTOMIZABLE EQUALIZER with lots of presets according to various genres to give you the best playback experience.